Cesium-131 is part of an emerging treatment trend for high-functioning patients with symptomatic brain metastases. Cesium-131 can also provide patients with recurrent disease an additional treatment option when previous treatments may have approached radiation dose limits to the body. The combination of interstitial radiation to the tumor bed at the time of resection delivers efficient targeting of the radiation to the tumor bed, while limiting dose to surrounding eloquent structures. The Cesium-131 radiation treats the tumor bed directly, with sources that are implanted at the time of surgery. Use of the implant at the time of surgery provides the patient with a complete treatment in a single treatment regimen. The combination surgery and Cesium-131 treatment is delivered by a multi-disciplinary team that includes surgeons, radiation specialists and a physics team to support the proper radiation dosing and delivery. Use of the Cesium-131, which is able to be implanted very quickly at the time of surgery, and starting radiation therapy at the time of resection as opposed to weeks after resection when using external beam radiation, are advantages of our novel approach. We are seeing 95% local control of the treated tumors in our study using surgery and Cesium implants. In addition, we observed a very low rate of radiation injury, which has been a major concern in the past, for patients who have undergone multiple treatments for their brain tumors. Cesium-131 delivers a highly effective radiation dose to the tumor bed. 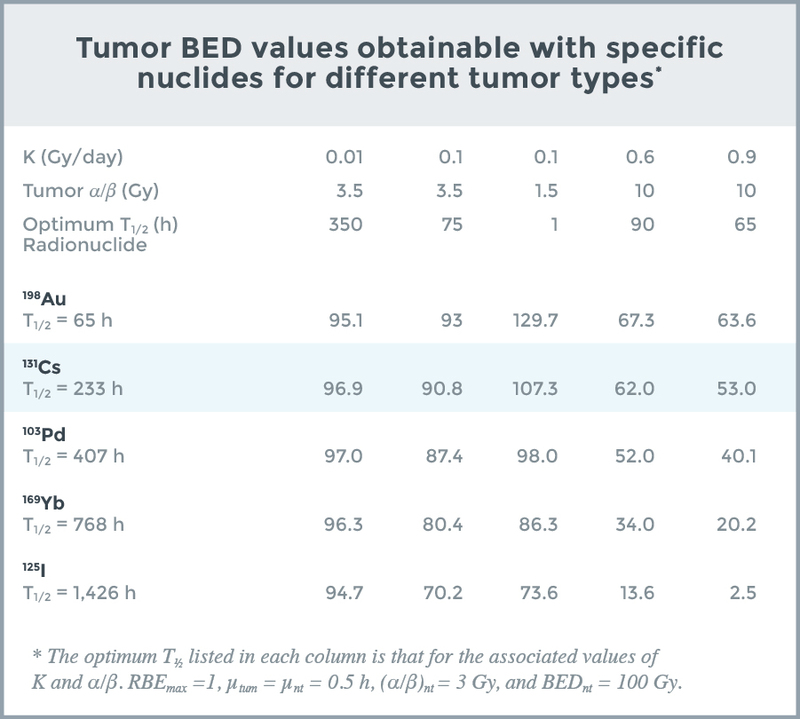 The use of Cesium-131 can provide a superior Biological Equivalent Dose (BED) in comparison to other isotopes when treating rapidly dividing cancer cells. A recent paper by Armpilia, et al, showed the cell response, based on cell division rates (noted as “K” in the table). The work suggested that Cesium-131 delivers a high BED to the fastest growing cancers but has a much lower energy level of 30.4 KeV, which distinguishes it from other isotopes. As you move thru the data to the right the cancers represented by the top line (“K”) multiply faster and faster. On the first line under “Radionuclide” you will see that the highest BED is from Gold however, the high energy level of 400 KeV significantly increases the risk of exposure to the operative surgeon and OR staff. Intra-cranial brachytherapy has been used in the treatment of brain tumors for decades. Early attempts involved the placement of high dose rate (HDR) implants temporarily in the brain for dose delivery. More recently, iodine-125 (I-125) permanent implants have been employed, with the University of California, San Francisco (UCSF) reporting a significant number of cases (McDermott 1998). Brachytherapy has special appeal as a brain cancer treatment due to the significant side effects that may occur when uninvolved brain tissue is irradiated to high doses. Brachytherapy offers a highly conformal dose (4) and is typically placed at craniotomy following resection of the tumor. Sources are typically positioned close to the surgical margin to account for any residual cancer cells. Radical resections of the brain are not usually undertaken, so adjuvant radiation is often desirable therapeutically. While control rates for I-125 following the procedure have been reported to be satisfactory, the occurrence of radiation necrosis of brain parenchyma has been observed. This necrosis is an unintended side effect of the brachytherapy implant, and has contributed to slow wide adoption of I-125 for brain brachytherapy. A review by McDermott (1) reports a range of 26 to 57% rate of radiation necrosis. These necrotic lesions often require a second craniotomy to resolve. Whether necrosis signals a positive therapeutic event in terms of cancer control is debatable, but still discussed. While long considered an attractive isotope for brain brachytherapy, due to its short half-life (9.7 days) and energy (30 keV) the radioisotope Cs-131 only became available as a brachytherapy source in 2005. Two groups – Cornell Medical College, NYC and Barrow Neurological Institute, Phoenix – independently began treatment of brain cancers with Cesium-131 brachytherapy placed at tumor resection. The results have been impressive, with rates of local control greater than 90% and rates of radiation necrosis less than 5%. (Reported by Dr. David Brachman at the Society of Neuro-Oncology meeting in Toronto June 2016.) These observations have led to the design of large trials intended to further study the outcomes of this treatment and standardize implant technique. The Cornell series report a 100% rate of local control (J Neurosurg 2014) with no observed radiation necrosis. A separate paper (J Neurooncol 2016) reported a quick recovery of cognitive function after implant. A third paper (Operative Neurosurgery 2016) details the procedure itself. It is thought that the low rate of complications is related to the stabilization of the resection cavity with fibrin glue; combined with the short half-life of Cesium-131 – where 90% of dose is delivered in 30 days — there is no extended irradiation of tissue outside of the intended field. Iodine-125 implants (90% of dose delivered in 180 days) may tend to irradiate normal brain tissue as the resection cavity collapses. The initial Barrow series was presented in June at the Society of Neuro-Oncology Conference on Meningioma, Toronto, Canada. The initial presentation demonstrated 95% of the treated tumors (19 of 20) had no radiographic evidence of regrowth of tumor at the operative site (local control). The incidence of radiation side effects to the brain – a problem in previous attempts to perform brain brachytherapy – occurred in only two of the 20 treatments. 1. Wernicke, A. G., et al. (2014). “Phase I/II study of resection and intraoperative cesium-131 radioisotope brachytherapy in patients with newly diagnosed brain metastases.” J Neurosurg 121(2): 338-348. 2. Pham, A., et al. (2016). “Neurocognitive function and quality of life in patients with newly diagnosed brain metastasis after treatment with intra-operative cesium-131 brachytherapy: a prospective trial.“ J Neurooncol 127(1): 63-71. 3. Wernicke, A. G., et al. (2016). “Surgical technique and clinically relevant resection cavity dynamics following implantation of cesium-131 brachytherapy in patients with brain metastases. Operative Neurosurgery 12(1): 49-60. 4. A. Gabriella Wernicke, M.D., M.Sc., et al. Phase I/II study of resection and intraoperative cesium-131 radioisotope brachytherapy in patients with newly diagnosed brain metastases. Journal of Neurosurgery, Aug 2014 / Vol. 121 / No. 2 / Pages 338-348.